What’s a road trip without great food? Television personality, author and Food Network star Alton Brown launched his #ABRoadEats initiative to discover culinary treasures and connect with his millions of followers while “Alton Brown Live: Eat Your Science” tours the country. Today, he is calling on his followers for gustatory guidance in each of the 28 cities he will visit this fall (www.altonbrownlive.com). Fans in Bowling Green, KY can submit recommendations for coffee and breakfast to late night munchies and everything in-between on his website, Facebook and Twitter using #ABRoadEatsBWG. Brown tabulates the votes each day and makes his picks from the submissions. “I do not eat a single bite of food that doesn’t come from the hashtag.” After his visit, Alton posts photos or videos and write-ups on his social media platforms. Brown created a new form of entertainment – the live culinary variety show – with his “Edible Inevitable Tour”, which played in over 100 cities with more than 150,000 fans in attendance. The Eat Your Science tour has sold more than 200,000 tickets in over 80 cities. Tickets are on sale now. Information about Alton Brown or the Eat Your Science tour can be found on Facebook: /altonbrown; Twitter: @altonbrown and Instagram: @altonbrown. Those with an appetite for more Alton Brown can find #ABRoadEats city-specific hashtags, and additional show and ticketing information at www.altonbrownlive.com. 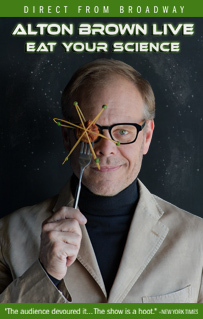 Get tickets for Alton Brown: Eat Your Science on Sunday, November 12 at 7:30 PM by clicking here, order by phone 270-904-1880, or visit the SKyPAC box office located at 601 College Street, Bowling Green, KY 42101.